Plenty of connections and a generous hard drive. The latest budget offering from Lite-On, the LVW-5055 isn't exactly the strong and silent type: it's noisy during operation, making some strange clicking sounds. Still, a drop-down panel that runs the full length of the fascia gives the impression that Lite-On has something up its sleeve. But all you'll find, apart from a DV-Link jack, is composite and S-video connections primarily to connect a camcorder. On some of the previous Lite-On models, this front connection was also useful for connecting a pure NTSC source, but not any more. Our Region I DVD of Poseidon had the usual problem with the vertical hold. The rest of the connections can be found on the rear of the unit and include two Scarts (one RGB, one S-video), another composite connection and component sockets. Buttons on the Lite-On are kept to a minimum, but you'll find the remote control has more than enough. The input button for choosing between separate items of kit is called the 'Source' button, while a single button for 'instant copying' is simply called 'Copy', as you'd expect. The onscreen menus are easy to navigate, from setting the video output (component, Scart or progressive) to aspect ratio and setting up of TV channels via the internal tuner. Don't select progressive scan playback if your TV isn't compatible, because there's quite a lot of switching off and on before entering a special code to return to the recorder's default TV output. The onscreen Channel Editor enables you to scan and, if you wish, rearrange your TV channels according to your personal preference. Lite-On's own Easy Guider on-screen user interface is also a doddle to use and offers a mine of information about the recorder. It has a list of helpful functions to its name and proved invaluable when recording. Depending on whether you're recording on the hard drive or going straight to disc (the Lite-On records on both DVD-R/RW and DVD R/RW discs), the Easy Guide will show you how in a series of clearly laid out menu screens. Assuming that you have enough space on the 250GB hard disk, you can set up to a maximum of 32 timer controlled programmes. There are five recording speeds and, amazingly, very little drop in quality from the SP mode (2hrs on disc, 55hrs on hard disk) and SLP (6hrs on disc, 330hrs on hard disk) aside from a slight flicker on fast movement and an occasional crackle on the soundtrack. Picture quality is good, although the occasional absence of any onscreen logo (apart from lots of white noise) when switching between DVD discs was a bit disconcerting. These are minor niggles with the Lite-On's impressive operating skills. 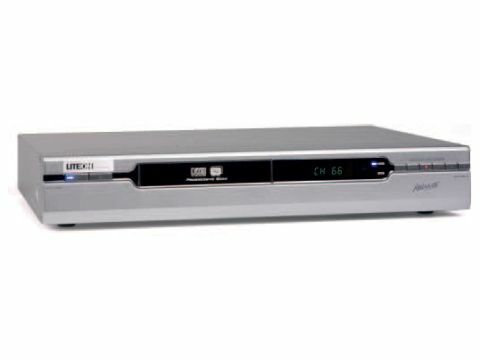 Its ease-of-use, clear and helpful menus, and generally good performance, makes it a worthy contender in the bargain DVD recorder stakes, despite the excessive operational noise.